Over the years, I’ve met many people who desperately want to be successful but who are ultimately unwilling to invest in themselves. They think, “I can teach myself. I can learn this on my own.” I’m always dumbfounded by this attitude. If I can avoid making a few mistakes, I’m going to. In my experience, having a great attitude comes with time and experience. The right coach will have been through it all — and come out the other side knowing a sense of humor goes a long way in business. They are able to see the big picture. They understand it’s all a numbers game. They don’t get too upset. An ideal coach is very patient, but also persistent and determined. A great coach is willing to share all of his or her experiences with you — the good and the bad. Do you get the feeling this person is holding back? That’s not a good sign. You’ll learn the most from someone who is willing to be radically transparent. A great coach will have longstanding relationships with people who could benefit you. Ask him or her if they’re willing to open doors for you. Sometimes, it is about who you know. “I am an Auckland based pet photographer. Bernie has been my photography business coach for over a year. Since I started my photography business over 6 years ago, I had struggled through every winter and was very close to giving my photography away. After working with Bernie, everything changed. Bernie has taught me how to market my photography, shown me how to develop and position my brand, lift my prices, and my pet photography business, is now in the position of having a waiting list of clients. I have tripled my average portrait sale since working with Bernie. I can’t recommend Bernie highly enough. He is an inspirational speaker and mentor”. Kimberely Kent, Tall Tails Pet Photography, Auckland, New Zealand. Many Photographers are struggling to earn a reasonable income through their photography, mainly because they are running their business the “old way” and have not kept up with new ways of Marketing, Website lead generation, and easier selling strategies. Learn the new ways getting customers in front of your camera, and how Social Media can help grow your business. The whole day will focus on re-defining your business with some brand new Marketing ideas, and an up to date view on using Social Media for your photography business. 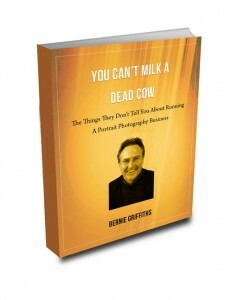 Bernie Griffiths https://www.berniegriffiths.com has over 40 years experience in running a successful photography studio, and now he coaches and mentors photographers around Australia and New Zealand. Johannah Barton is founder and owner of Confetti Design http://www.confettidesign.com.au specialising in branding, website design and small business marketing. Johannah, coming from an artistic family is sensitive to creative industries, and specialises in working with photographers. Cost…EARLYBIRD $47 before 25th September… $97 after that date. They have money coming in, and money going out at the same rate. This is one of the most frustrating periods of a business life. The photographer is working long hours running the business, but at the end of the day has absolutely nothing in the bank account as a reward for their hard work. I remember going through this period in my business. I was frustrated, miserable, angry, and could not see any light at the end of the tunnel. After searching my own brain and not coming up with an answer, I asked my daughter for advice. She does after all have two Marketing degrees, and works for a multi million dollar International company as a Marketing manager. Her response came quickly and was very brief. “Dad………you can’t milk a dead cow.” It took me by surprise. It took me a few days to get clarity on her statement, but when I did, I knew exactly what to do. The cow was my business model. What she meant was that my business wasn’t dead, but the way I was running it was. If was no longer working……. it was dead! I HAD TO STOP TRYING TO MILK IT. I had to stop living in the past….that was over. So how did I move forward and resurrect my business to continue on successfully for many more years. It was time to clear the past Marketing, processes, pricing, products, mindset, and CHANGE a few things. The first thing I changed was my mindset. I determined to focus on the future, and recreate myself. I learned more about Marketing, and made overall change in my business. Slowly my business turned around. I became profitable again, as my new cow started producing milk. Most leave it too late, because they can’t get out of their comfort zone. You can keep doing the same things that aren’t working or you can do something that will change your life. When I am Coaching the clients that I have who are feeling this pain, I know how they feel. But I also know how to help them.